Zach Randolph, who has scored 20-plus points in his last three games, wasn't pleased with the 'horrible refereeing' in the Grizzlies' Thursday loss the Rockets. 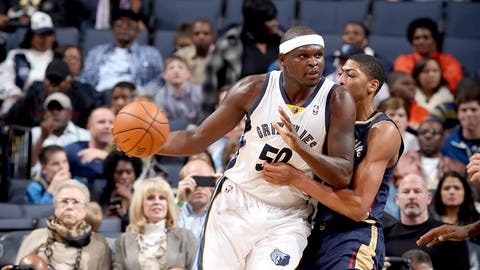 It’s been an interesting post-Christmas experience for Zach Randolph. On Friday, the Memphis Grizzlies forward was fined $25,000 by the NBA for criticizing league officials after his team’s Thursday loss to the Rockets. Just a few hours before, the city of Memphis had begun celebrating "Zach Randolph Day," a 24-hour homage to Randolph’s charitable work within the community. On the court, Randolph was apparently peeved that Rockets forward James Harden, who made only 2 of 9 shots against the Grizzlies, had been awarded 25 free-throw opportunities from the officials (making 22). Randolph’s fine-clinching quote likely involved him decrying the "horrible refereeing" in the Houston game. Consequently, Harden became the first player in NBA history to register 27 points on two or fewer field goals.